This mill home, over a century old, is completely renovated to modern standards while keeping its nostalgic charm. 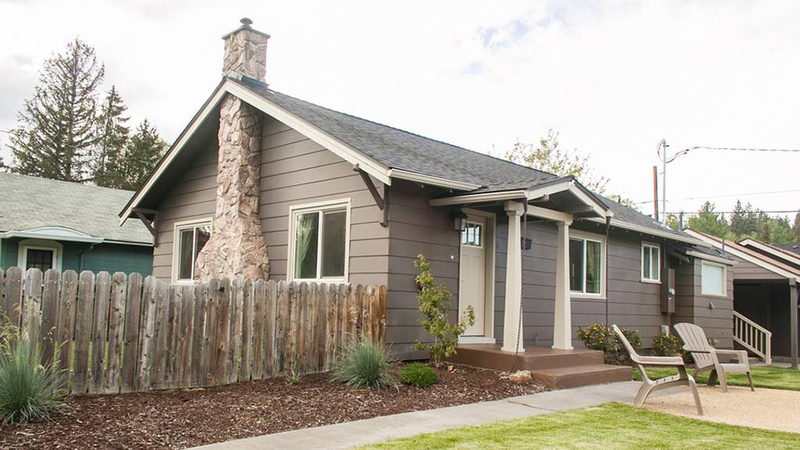 The 2 bedroom, 2 bathroom charmer is on Bend’s west side, has a five-minute walk to the river and Drake Park and a ten-minute walk to downtown. It’s also walking distance to restaurants and local breweries. With 1 king bedroom (new king bed as of August, 2016) with master bath, the second bedroom has a queen bed (new as of December 2016) and a twin bed. The master bath has a shower, pedestal sink, and toilet. The second bathroom has a clawfoot bathtub, vanity cabinet, and toilet. The living has 1 queen sleeper sofa (new as of August 2015), 1 bench, 1 leather chair, 1 upholstered chair, and a decorative fireplace. The rectangular dining table seats 6, there is free wifi, and cable TV. Consumables provided include shampoo, conditioner, body gel, hand soap, dish soap, laundry detergent, and starter packets of coffee. With carport parking for two vehicles, it’s also a corner home with plenty of street parking.